Once upon a time, a media junkie and an astrophysicist decided to get an apartment together in the little town of Boston. You might think that these disparate fields would leave them little to talk about, but a strong compulsion to voice their opinions kept them trying. Views collided, debates heated up, and humor burst forth from each clashing of personality. Eventually, a camera was brought in to the mix and the rest is history. So carry on, dear reader, and learn as we did that although the world is many things, it was never meant. 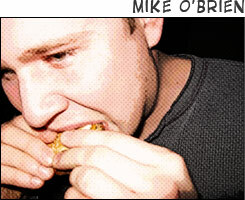 Mike O'Brien went to Hampshire College where he studied screenwriting with a minor in Tolkien Studies. He is mostly concerned with amusing himself, which is why he lives with Peter. He jokes often, but is most serious when trying to make people laugh. He enjoys Guinness and reminding people of his Irish heritage. 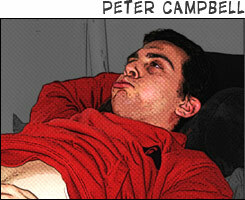 Peter Campbell studied astrophysics at Boston University. Almost everything he does is an inconvenience to the people around him (especially Mike). Many of his ideas would be described as 'hair-brained' although Mike would argue there is no brain to speak of. His greatest strength is his confidence that he is always right, although his biggest weakness is that he is usually wrong. 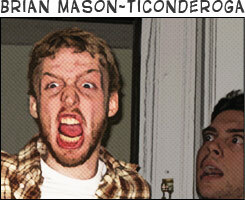 Brian Mason-Ticonderoga is a Cancer. He enjoys Philly Cheesesteaks and knives. He may or may not have entered an unholy pact with some sort of demon in exchange for righteous guitar skills.